I've apparently been on a dragon kick lately, and I liked this version. They're essentially shifters, although their dragon form is their true form. They have a lot of magic. What's really fun though is that they're different from humans personality-wise because they're all greedy and manipulative and ruthless and ambitious, and they consider humans beneath them, akin to pets or slaves rather than equals, which is why Julius is such a bad dragon---he's too nice. The world-building was interesting too. It's a future in which a meteor brought back all the magic that the world once had, so now there are spirits and dragons and all sorts of creatures. The whole underground area was unique. Even the details about the dragon clans and how differently they do things, like Bethesda and her many clutches, was cool. The characters were also great. Julius was easy to like and feel for, despite his lack of ambition (I could understand why he hid in his room all the time, considering what his family was like). He really was a nice guy, and I felt for him every time someone treated him kindly and brought him some happiness. And it turned out he could be crafty, as long as he didn't have to hurt people to do it. Marci was easy to like too, full of life and energy, determined even in the worst situation, intelligent, skilled at magic, but also just quirky and imperfect enough to be relatable and realistic. Even the side characters were unique and interesting, albeit dangerous and manipulative. Overall this was some really solid urban fantasy, but in a way that didn't feel like the same thing I've read a million times. It stood out from the pack, it gripped me, and I enjoyed it! 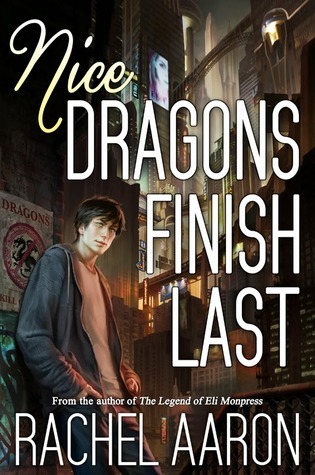 Sign into Goodreads to see if any of your friends have read Nice Dragons Finish Last.